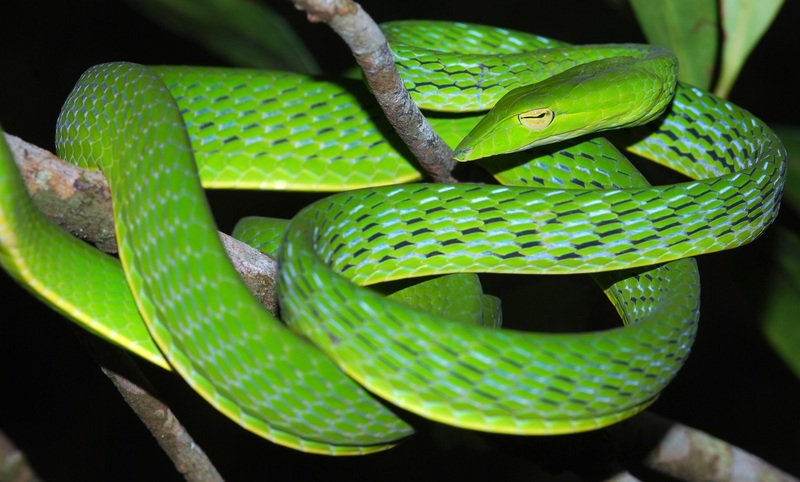 There are 8 species of Asian Vine Snake found in the rainforests of countries like India, Burma and Malaysia. The biggest species, like Ahaetulla prasina, may reach some 1.8 metres (6 feet) long, while others are just 60 cm (2 ft) in length. 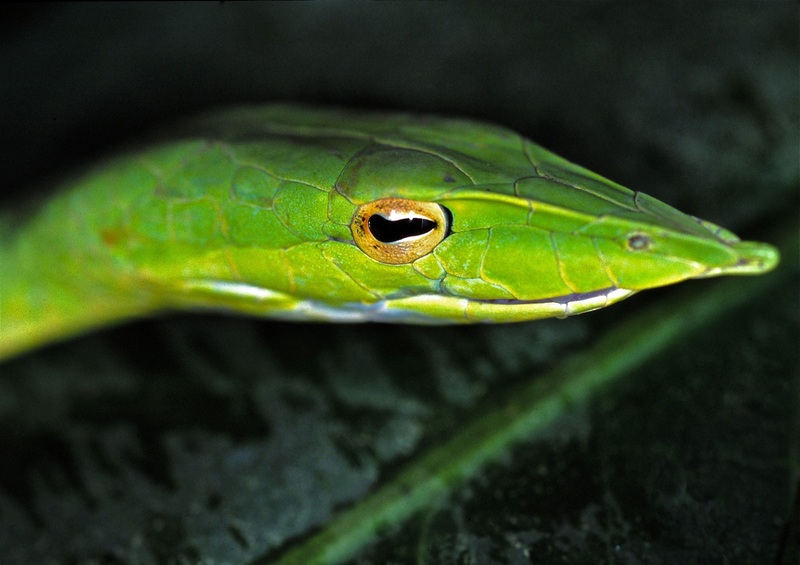 Oriental Vine Snake (A. prasina). Check out that binocular vision! However big they are, they're always incredibly slender and a lot of them are a beautiful, bright green colour. That's why they're called Vine Snakes or Whipsnakes. 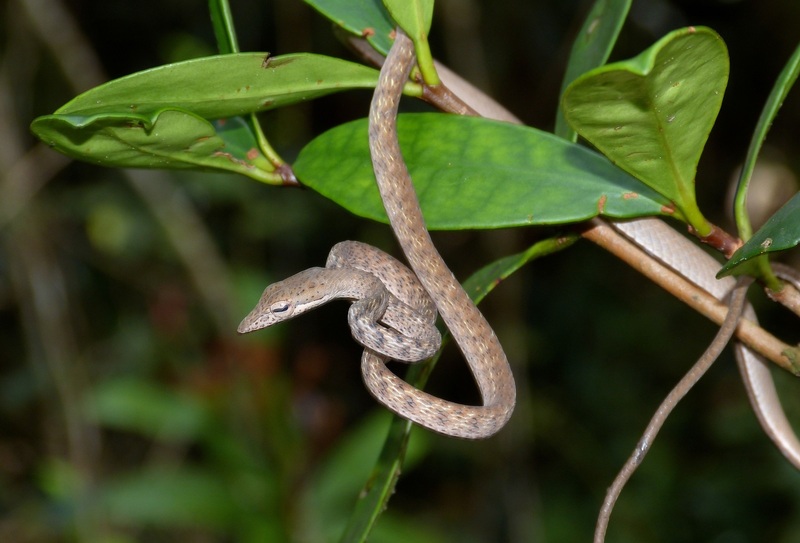 Speckle-headed Vine Snake (A. fasciolata)... not green! 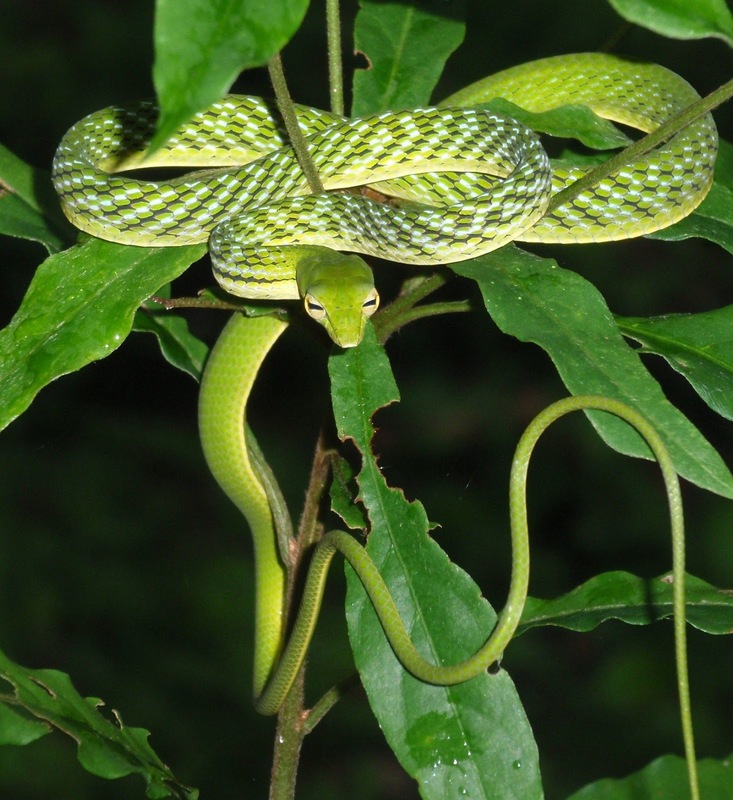 Asian Vine Snakes spend their lives up in trees and shrubs, clinging to the branches and mostly not moving much. That way they can remain well camouflaged and watch the world go by with their enormous, unimpressed eyes. 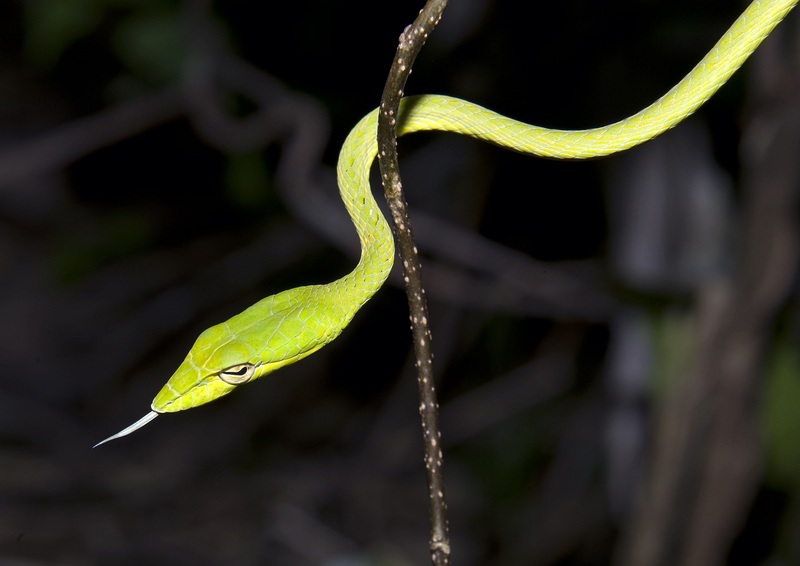 One really cool thing about these snakes is the incredible control they have over their bodies. Have you ever done that exercise where you lay on your back, feet together, lift your heels an inch off the floor and try and stay like that for as long as possible? 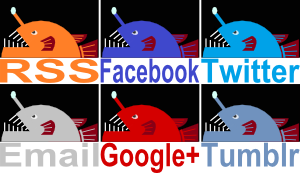 It quickly becomes agony! 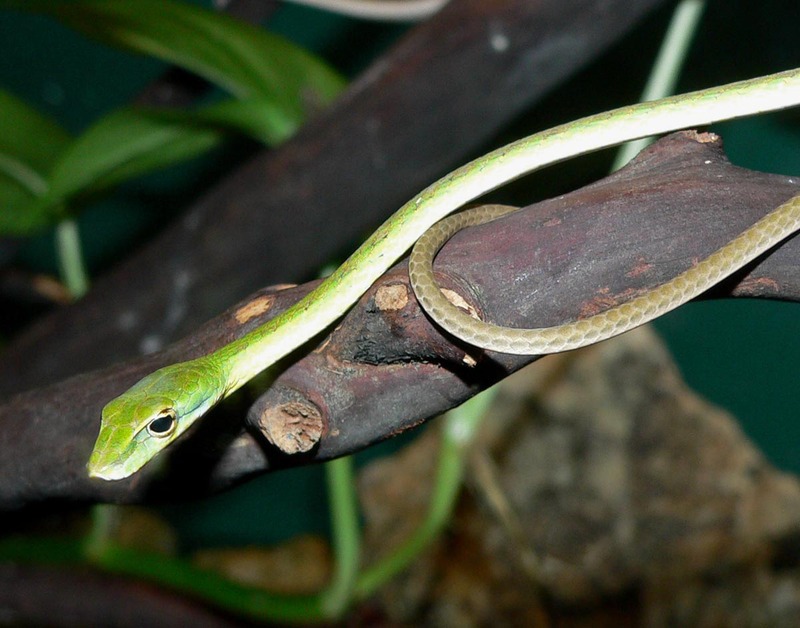 Oh, to be a Vine Snake! With their tail securely wrapped around a branch, they can hold practically their entire body horizontal and just stay like that for ages. I can't even keep an arm or two horizontal for long before it starts to hurt! I'm sure this skill is great for stalking prey and stretching out to grab another branch, but they also make for really good dowsing rods. Just grab one by the tail, walk around a bit and it'll find a tree for you in no time. Being able to find trees is a skill that's always in high demand. If you do grab a Vine Snake by the tail, he might not like. At least one species demonstrates their discontent by sticking out their tongue and leaving it there for quite a while. Not flicking in the usual snake style, just pointing straight forward as if to make the snake appear a few centimetres longer than it really is. Perhaps it's threatening you with the length of its face. You thought it had a fairly pointy face, but now it's showing you that its face is way more pointy than you realised and you have clearly bitten off more than you can chew. Sounds silly, but it might have worked! These snakes all belong to a genus called Ahaetulla, which comes from the Sinhalese for "eye plucker". They don't really pluck out anyone's eyes, though (but it would be amazing and horrifying if they did! Imagine if there was a bone in their tongue that did that. A bayonet tongue). 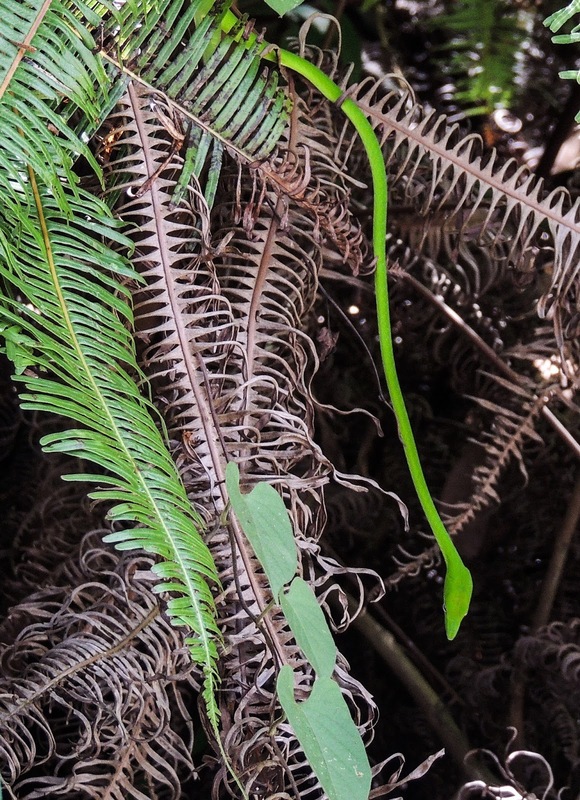 Asian Vine Snakes are quite shy and often don't even bite. Their venom is quite mild anyway, and seems to cause little more than a bit of swelling in humans. Also they're rear-fanged. Their fangs aren't at the front of their mouth like in vipers, but at the back instead. Regardless, the fangs and venom are sufficient to rapidly paralyse the fast, energetic lizards that make up their diet. One species even clings to a branch overlooking a river and feeds exclusively on fish! They may look dainty, but they're still deadly. At least to lizards. As we all know, Tarzan swapped his loincloth for smart-casuals and retired to Surrey. They sure are! Although, I don't know if a garden of eden moment is a good thing or a bad thing when you're talking about a snake! It's a good thing. For the snake, at least. That has to be the cutest threat display I've ever seen in a snake. @Crunchy: I'm pretty much always on the animal's side so that works for me!